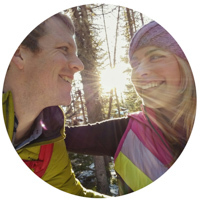 When packing for an overseas adventure, less is generally more. Most people (myself included) attempt to pack light so they have room for souvenirs and aren’t forced to lug around a giant suitcase. So investing in a few quality travel products will help you save room for other travel essentials. What is the total size and weight of the hair dryer? Does it have dual voltage capability so it can be used internationally? Does it have enough power to get your hair dried quickly? 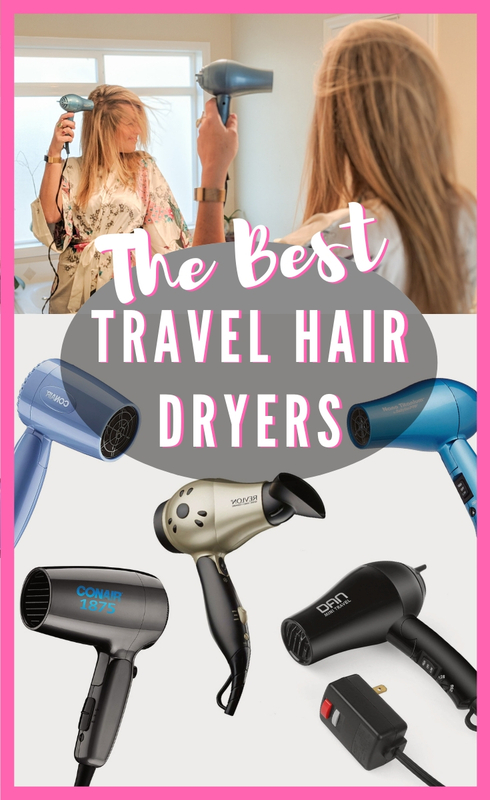 Below are the 5 best travel hair dryers that meet my requirements of being lightweight and compact, with dual voltage capability and a powerful air flow. They are ranked from my top choice to last, but really you can’t go wrong with any of them! 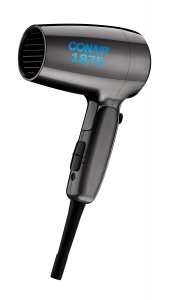 This compact folding hair dryer by Conair is our #1 pick for best travel hair dryer on the market! It is quite small so it can fit easily into your suitcase, but it also has a ton of power and will have no trouble getting your hair dry quick. You can easily switch between 125-250 volts depending on what country you are visiting. And for the inexpensive price, it’s unbeatable! People love that this hair dryer is little but packs a big punch. It is just as powerful as a regular sized hair dryer (if not more) but it can fold up so tiny. You’ll love having this during your travels! The BaBylissPRO Nano Titanium Travel Hair Dryer is slightly larger than our top choice but packs a similar punch when it comes to air speed. It’s lightweight, compact, and has dual voltage for international travel, making it one of the top travel hair dryers on the market. I’ve been carrying this little hair dryer around with me for the last year and absolutely love it! It is just as powerful as any regular-sized hair dryer that I’ve ever owned, but at a fraction of the size. You can trust the Conair brand to be durable, reliable, and reasonably priced. 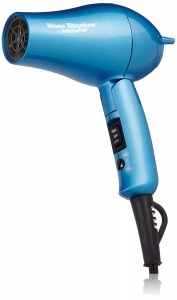 The Conair 1875 Watt Compact Folding Hair Dryer is similar to our #1 pick but a bit larger in size. It also has a higher wattage so it will dry your hair faster. But it also has dual voltage for international travel and it folds down small. People love how powerful this little hair dryer is. It’s lightweight (only 1 pound!) and folds up easily. It is our third choice due to the fact that the air intake flow on the back of the dryer can catch your hair if you’re not careful. 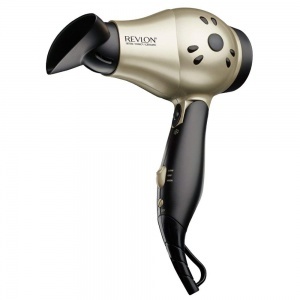 The Revlon 1875W Compact Travel Hair Dryer is a our #4 choice as it is a bit larger than the other three. It also has a folding handle so it can pack up easily, plus it has a detachable smoothing concentrator which will leave your hair feeling soft and sleek. It is also designed with ceramic and ionic technology to reduce hair damage and frizz! People who have purchased this travel hair dryer from Revlon love how much power it has and how quickly it can dry their hair. Some people might find this one to be a bit on the loud side when it is on the highest setting. 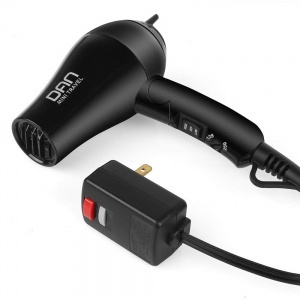 Not only is the DAN D29 1200 W Hair Dryer incredibly small and lightweight, but it also comes with two extra attachments for styling. With dual voltage (125-250V), it’s the perfect international travel companion! People who purchased the DAN D29 Hair Dryer love that it folds up small for packing, but also comes with convenient attachments for styling! Want to see other travel beauty products that I love? Check out my list of 35 favorites!